Steinle was shot on a San Francisco pier in 2015. 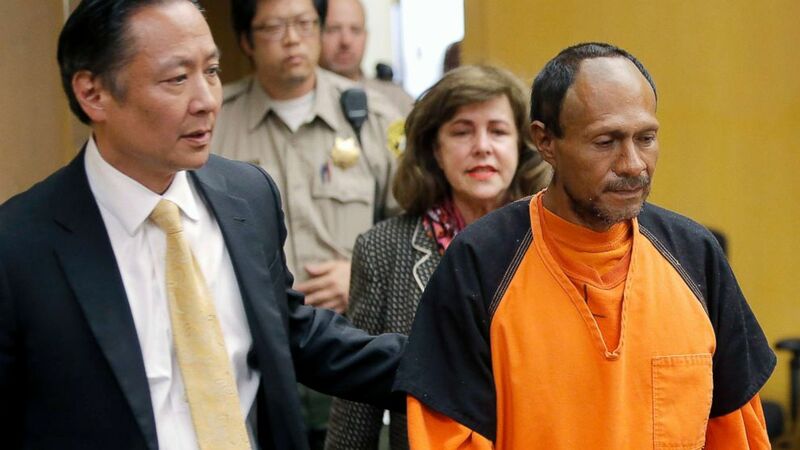 A jury has found Jose Ines Garcia Zarate not guilty in the murder of Kate Steinle, the woman whose shooting death on a San Francisco pier in 2015 ignited an immigration debate. Garcia Zarate was acquitted of first-degree murder, second-degree murder and manslaughter. However, he was found guilty of being a felon in possession of a firearm. Garcia Zarate, of Mexico, had been deported several times and has previous convictions for re-entry after deportation. Before the killing, he had been released from a San Francisco jail after a minor drug charge was dismissed. While U.S. Immigration and Customs Enforcement had issued a detainer for Garcia Zarate, he was released under the city's sanctuary laws. (Michael macor/San Francisco Chronicle/AP) Jose Ines Garcia Zarate, right, is led into the courtroom by San Francisco Public Defender Jeff Adachi, left for his arraignment at the Hall of Justice in San Francisco on July 7, 2015. The murder trial started Monday, Oct. 23, 2017, for Garcia Zarate, a Mexican man who set off a national immigration debate after he shot and killed Kate Steinle on a San Francisco pier on July 1, 2015. Garcia Zarate had claimed he found the gun used in the shooting wrapped in a T-shirt under a bench and that it went off accidentally, The Associated Press reported. But prosecutors argued he carelessly pointed the weapon at people. The Bureau of Land Management previously said that the gun belonged to one of its enforcement rangers and was stolen from a federal agent's car. The case gained national attention during the 2016 presidential race when then-candidate Donald Trump cited it as an example of why the sanctuary cities, which limit a city's cooperation with the federal government's efforts to enforce immigration law, should be ended. Following the verdict, Trump tweeted, "A disgraceful verdict in the Kate Steinle case! No wonder the people of our Country are so angry with Illegal Immigration." Rep. Eric Swalwell, D-Calif., a vocal opponent of the president whose district includes parts of the Bay Area, also was unhappy with the verdict. "I greatly respect our jury system," Swalwell tweeted, "but I could not disagree more with this verdict. I pray for Kate’s family." It was so quiet in the courtroom when a member of the jury read the verdict that "you could hear a pin drop" because everyone was "very anxious" to hear it, said Lyanne Melendez, a reporter for San Francisco ABC station KGO who was in the courtroom. Defense attorney Francisco Ugarte offered his condolences to the family after the verdict was read, telling reporters Steinle's death was an "incomprehensible tragedy." Ugarte added the case "was used to foment hate" and "catapult the presidency." "Today was a vindication for the rights of immigration," he said. "We have to reflect on how we talked about this case," adding that nothing about Garcia Zarate’s race and immigrant status had any relevance the case. 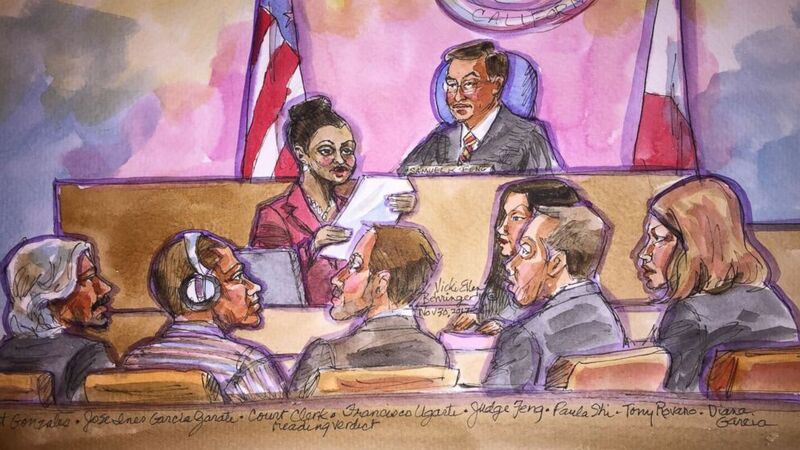 (Vicki Behringer) A courtroom sketch of Garcia Zarate, second from left, listening to the verdict being read in San Francisco on Nov. 29, 2017. Alex Bastin, deputy chief of staff for the San Francisco District Attorney's Office, said the verdict was not what they had hoped for but they would respect the jury's decision. In a statement, Attorney General Jeff Sessions said, "When jurisdictions choose to return criminal aliens to the streets rather than turning them over to federal immigration authorities, they put the public’s safety at risk. 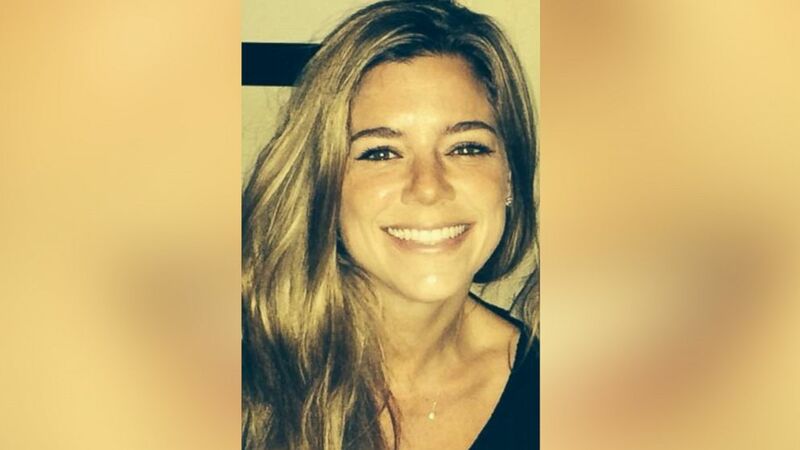 San Francisco’s decision to protect criminal aliens led to the preventable and heartbreaking death of Kate Steinle. "I urge the leaders of the nation’s communities to reflect on the outcome of this case and consider carefully the harm they are doing to their citizens by refusing to cooperate with federal law enforcement officers." And U.S. Immigration and Customs Enforcement (ICE) deputy director Tom Homan said in a statement, "This tragedy could have been prevented if San Francisco had simply turned the alien over to ICE, as we requested, instead of releasing him back onto the streets ... ICE will work to take custody of Mr. Garcia Zarate and ultimately remove him from the country." Steinle's family told The San Francisco Chronicle that they were "saddened and shocked" by the verdict. "There’s no other way you can coin it," said Steinle's father, James Steinle. "Justice was rendered, but it was not served." (Steinle Family) Kate Steinle is seen in an undated photo released by her family. Before the verdict was read, Steinle's family told the Chronicle that they just wanted "move on" with their lives. They were not in the courtroom to hear the jury's decision. "We have never had a second of anger -- not a moment," James Steinle said. "Frustration, maybe, and sadness for sure, but no anger and no retaliation or vindictiveness or anything like that. We’re not that kind of people." ABC News' Marilyn Heck and Pierre Thomas contributed to this report.